It wasn’t that long ago Sam McClure was running errands and buying coffee for on-air talent at a local Melbourne radio station. Fast forward to 2017 and the award-winning journalist got his next break, when he joined 1116 SEN’s weekday breakfast show. Sam has an inherit flair for footy and journalism, his father Geoff McClure was a renowned sports journalist at The Age. Also writing for The Age, he radiates enthusiasm for his craft of storytelling and those aspiring to break into the industry can certainly learn a thing or two from him. It’s hard to believe Sam was only 25-years-old when I spoke to him in 2017. 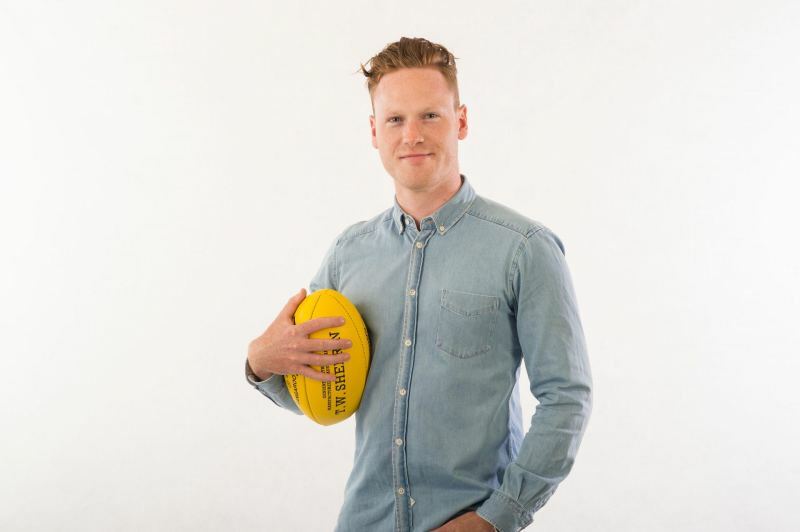 I caught up with the multi-talented journalist, one month since he started with Melbourne’s leading sports radio station, to find out how he went from running errands to being one of the on-air talent himself. Have you always been into footy? Ever since I can remember, even before I remember being able to walk footy was everything! My old man was a sports journalist and so growing up in the rooms of Optus Oval (Princes Park) after games my dad was always getting stories. I grew up with not only footy, and loving and playing footy, but also the journalistic side of it, which gave it a whole different element, and has always intrigued me and continues to today. I’ve loved footy for the game and for the stories ever since I can remember. Tell me about your career and how you’ve arrived to be a part of the 1116 SEN breakfast team. I was 18 when I lost my old man to cancer which had a massive impact on me. We were best friends and I wanted to be him. At the end of 2010, I was a year out of school and got a job with 3AW as an OB assistant (broadcast assistant), so my job was basically to buy coffee for people and I slowly got into different roles from there. I started producing Tom Elliott on The Weekend Break, I was answering phones on all the different programs across 3AW, then I moved into the newsroom and was working as a general reporter for a long time. I always loved sport so moved into sport eventually full time in the newsroom, and then that’s when I started getting into Sports Today on 3AW. Gerard Healy gave me an opportunity to come onto the show and give a sports wrap and that naturally evolved into breaking a couple of stories here and there. That’s sort of how I found my niche, so with Gerard and Dwayne Russell I was doing their show five nights a week while working in the newsroom, and then I moved away from the newsroom at 3AW to The Age, which I still do at the moment and I really enjoy. It was an opportunity that came along with 1116 SEN, which sounded exciting from the start but I was adamant that I didn’t really want to leave 3AW. But it was just such a good opportunity with such good people, and it was a really good opportunity for me to spread my wings and really challenge and test myself. 3AW gave me an amazing platform to be able to do that but at the end of the day 1116 SEN just had a better opportunity for me to try and do more, and do a bit more hosting and have a bit more responsibility which I thought could help progress my career. Did you study at uni at all? I did media and communications at Melbourne Uni, which was basically the alternative to doing journalism at RMIT. That was a three year course, and as I explained before I was sort of working in the industry as I was studying and learnt so much more actually working in media rather than studying it. That’s not to recommend people don’t have to study in the industry (but) I found a lot more of my knowledge was coming from that rather than studying. Your dad was a football journalist, how did he inspire you to follow in his footsteps? It’s like anything as a kid when you grow up close to someone you’re always interested in what they do because you’re still learning a lot about life, and his life at that stage was at the peak of his career and I heard about it everyday, I watched it unfold so naturally I was curious. I played footy often, as a lot of kids do growing up, so I loved the game. Dad inspired me because he loved telling stories. He’d come home from work and he’d be so excited, not necessarily about his job, the hours he’s put in, but the stories that came out of it. He just loved being able to tell someone something that they didn’t know before. Breaking it down that’s what the whole industry is really about, when it comes to journalism, particularly in footy. People want to find out stuff that they didn’t know before, they want to have better insights into players, coaches, clubs, and CEOs, they want to know as much as they can. Dad loved that element about it and I think I actually picked up on that as well, so I’ve been very lucky like that. What’s been the biggest achievement of your career to date or story that you’ve broken? I think the Gary Ablett one at the trade period last year that Caroline Wilson and I broke for The Age about Ablett going to the Gold Coast Suns and basically asking, or requesting, a trade home to Geelong. Stories are not as often about the content as they are of the reaction, and that set the agenda for a lot of chat about footy because people wanted to know was it appropriate that a captain of a franchise club wanted to go home, was it selfish, was it fair enough, was this the changing face of football? Anytime you break a story that adds an agenda and you know that it’s something that people want to talk about… and there was a big flow on effect from that (the Ablett story). What advice would you give someone who wants to break into sports media? The one inherent thing that I’ve learnt is to just keep on keeping on. You can study and you can do work experience, you can get good grades and all that sort of stuff but at the end of the day I think this industry is very different to other industries because it’s simply about who wants to work the hardest for the longest to get anywhere that you can get. I never think too far in the future and I didn’t think about the future a lot when I was 18 and buying people coffee, but because I really enjoyed it and really enjoyed meeting people and finding out about who they were, then that lead to one thing to another thing which lead to another thing. So my advice is if you really want to get somewhere you just keep knocking on the door because eventually it’ll open at some stage, you’ve just got to be patient and persevere. What’s it been like working Garry, Tim and Hamish at 1116 SEN? It’s been great, I was nervous going into it like any fresh show in any medium you don’t know what it’ll be like because of the different dynamics, but it’s only been a month, we just finished our fourth week so it’s been exactly a month on air, and it’s been sensational. Garry is one of the best footy analysts the game’s got and he has an amazing way of breaking things down and finding a story in something. You’ve got Tim who has one of the best senses of humour you’ll ever see in anyone in footy media, his humour is unbelievable, and he’s so insightful as one of the game’s former greats. Then you’ve got Hamish who’s the perfect segue into all things to do with life. He has an unbelievable mind, a sponge of a mind that can take an issue and talk about in any shape or form, he’s unbelievably well read, he’s highly intelligent and he’s different to the other two because he’s not a former player so he brings that different energy. It’s only been a month so things are going to change with every week that we go forward but I’m loving it at the moment.